In this interview Mike Konshak talks about collecting vintage slide rules, and their history and uses. Based in Louisville, Colorado, Mike can be reached via his website, Slide Rule Museum, which is a member of our Hall of Fame. I’m 61 now, and I’m an engineer. I was thinking if I ever wanted to collect something, I would probably collect slide rules because they’re small, they don’t take up much space, and they’re an engineering tool. Then one day I went on eBay thinking I’d just buy myself about 10 slide rules and put them in a little display case, and I bought a couple. I talked to some other collectors about if you had to have a slide rule, which one would it be? And I bought those. It kept expanding to the point where I ended up with over a thousand slide rules. The website, basically, was a tool I would use to help me understand slide rules. When I’d find a term or a gauge mark I didn’t recognize, I’d research it and then add that to my encyclopedia as a reference. I also opened it up to other collectors so they could put their own collections on it too. Collectors Weekly: When did you start the website? Konshak: I’ve been collecting for five years, since 2003, and that’s how old the website is. I don’t buy slide rules anymore, I basically collect scans from other collectors. I still have probably about a hundred slide rules, my personal favorites. I gave almost the entirety of the collection, about 1,000 specimens, to the Computer History Museum in Mountain View, California and got a tax write-off. I also knew that if somebody wanted to come by and see the slide rules, that was a better place for it. So my website now is more of a virtual museum in that people give me scans from their slide rule collections, ones that I’m missing, so I can document them. In some cases, people will mail me their slide rules to add to the museum as a memorial for their parents or grandparents. It’s the world’s largest online slide rule museum, and it gets about 30,000 hits a day from all over the world. And the manuals get downloaded a lot. Interestingly, one of the files that gets downloaded the most is a slide rule manual that’s written in Russian Cyrillic. There were over 800 different slide rule manufacturers during the heyday, a lot of people making slide rules. And there were always these subtle differences, and who the maker was. So the website really started out as a way for me to document and keep tabs on the ones I already owned before going out and buying another one. I’ve now added a good slide rule encyclopedia on top of the scanned manuals for the most common slide rules. So if you find a slide rule and are trying to figure out how to use it, you can come to my site, and probably find the manual that’ll tell you what to do. I also have an online course on how to use a slide rule, which has been popular. And since some teachers have contacted me about teaching their kids with slide rules, I have loaner slide rules that I lend out, 25 identical slide rules at a time, to schools. Finally, when people ask me about donating slide rules, I help them donate it to the museum. But I also try to get a picture of their dad or mom or whoever used it, whether they were an engineer or math teacher or scientist or economist or military guy. I put it up on the site as a small memorial that shows the good people who used slide rules, who helped shape history, because I think that’s more interesting than just the slide rule itself. Another person sent me a slide rule he’d used at school in Boulder, Colorado (CU) back in the 1930s. He actually sent his diploma along with the slide rule and a big picture. I ended up taking it to the University of Colorado and donating it to their Heritage Museum. I’ve also become a resource for other museums. Collectors Weekly: Do you focus on a certain type of slide rule? Konshak: Most all slide rules or circular slide rules had logarithmic scales on them, they were used as a calculator for doing math. There are other types of slide rules which were made out of cardboard, or were made for special purposes like textile work, things like that. But I’m not much interested in them. I’m more focused on the ones that were actually used to teach math, including the teaching slide rules that were used up through the 1970s. In physics and math classes, they usually had a demonstration slide rule at the head of the class – a very large one – that the teacher would manipulate to show the students how to calculate a particular answer. Like I said, there were over a thousand different types of slide rules. My site represents at least 150 different manufacturers. The differences are mostly the materials and construction methods. Most people have a favorite slide rule. Some like metal; others might like mahogany or bamboo. People tried making slide rules out of everything. The Japanese all used bamboo. America was partial to mahogany and basswood. Europe also used basswood and mahogany, but different variations of it. Then there were different types of celluloid, but the early celluloid slide rules were very brittle. And the different types of plastics that evolved after World War II – most slide rules ended up being made out of plastic. Or wood, with celluloid laminate on top. And the cursors were typically made out of aluminum or steel or brass, tin-plated, and glass or plastic lenses with one or more hairlines, depending on the type of slide rule. Some of the cheaper slide rules were just a piece of wood with the scales printed on it. So they didn’t actually have grooves in them, and the scales could wear off over time. At one time you could buy a low-end slide rule for a quarter. And I remember as a kid at 13 years old, I had gone to the National Association of Rocketry, and we used slide rules to determine how high our rockets went. And you could get a cheap slide rule through the folks that sold the rocket motors. Another difference between slide rules was how they did the division markers. The earlier slide rules were all done by hand. They had a master, and the guy would just sit there and cut the grooves and hand-engrave the numbers in. Later on, they were mass produced, and manufacturers competed to see how many scales they could get onto a slide rule (scales were equivalent to the buttons on your calculator). For many years, most only had six or seven scales. But then the geeks in the schools, of which I was one, would want slide rules that had more and more scales on them. Essentially more functions that would do something another slide rule wouldn’t, and that could make your task easier. You could do any math problem you wanted on your basic slide rule, but the ones with more scales saved you steps. Collectors Weekly: When were slide rules invented? Konshak: William Oughtred is credited as the inventor of the slide rule. He basically took two logarithmic scales and put them next to each other and figured out that you could multiply and divide by adding the logarithms together. He lived from 1574 to 1660. In the 1800s, slide rules became standardized, and it wasn’t really until the 1970s that electronic calculators came out and the slide rules went the way of the buggy whip. The earlier models were all made out of wood. Then around 1900, they started putting white celluloid on top of the wood. And a lot of people think its ivory because it has a yellowish hue to it, but it’s not. The celluloid starts to yellow and gets that patina. The laminated slide rules made for a better contrast and made it easier to clean. It also kept them from warping. Collectors Weekly: Who were the major manufacturers? Konshak: Two of the biggest slide rules makers in America were Pickett and Keuffel and Esser. Pickett started making them out of magnesium at the end of World War II and then switched to aluminum. They had some corrosion problems. Keuffel and Esser, they used mahogany on theirs with plastic laminate later on. Around 1930 there was Gilson. And Dietzgen was another big American one. Post sold a lot of slide rules under the name of Frederick Post, and later on just Post, which later became Teledyne. I personally tend to like the earlier American manufacturers like George Richardson. He’s the archetype – my kind of guy. He made the slide rules in his home and shipped them out to folks. When he sold out, it was to another family, and they did the same. So there’s a lot of personal history there. The other majors were named after their founders as well. Pickett was named after Don Pickett. Keuffel & Esser was named after their founders. They sold drafting supplies and other tools as well. Some manufacturers just made slide rules, but others made drafting instruments and anything that had scales on it or was used for mechanical drawing. I was a product of the whole generation of engineers who started with drafting boards and slide rules and ending up with electronic calculators and computers. Back to manufacturers, there was also a popular imported slide rule from Japan made by Hemmi, that was a very good slide rule, and was actually the slide rule issued to the Air Force Academy cadets in the ‘70s. Lawrence made the low-end slide rules, and they later became Sterling and spun off a few other makers. Acu-Math was another big one. After World War II when we were trying to help the Japanese get back into business, we would import a lot of Japanese slide rules and with different American brands on them. So they all looked the same except for the logo of whatever company was distributing them. In fact, there was a big business just selling slide rules to U.S. corporations who wanted to put their name on them. To companies like JC Penney and Sears, who offered them in every catalog. They were just re-branding them. In Europe, two big manufacturers were Faber-Castell (originally A.W. Faber) and Aristo, both out of Germany. France had Graphoplex. And the British had a whole mess of slide rule manufacturers because that’s where they were invented. William Oughtred was an Anglican priest in England. Some of the British slide rule makers included Blundell and Stanley, British Thornton, and Technical Standards. And there were others – Unique at the low end, Sperry, Polar and so on. There wasn’t any difference between the slide rules in America and the slide rules in Europe. The scales were the same. The metric system was used in all the slide rules, so it was really a matter of how many different colored inks you might use or the size or the placement of the slide rule. There were also pocket slide rules, a variation of the larger size, which was basically 10 1/2 inches long. The scales were basically either 10 centimeters or 10 inches. If they had a 10-inch scale, all the divisions were based on that overall length. And so the sizes they had were the 5-inch long pocket slide rule, the 10-inch standard slide rule, and the 20-inch long, which gave you a little bit more accuracy when you were trying to extrapolate. They also had these really large teaching and demonstration slide rules. 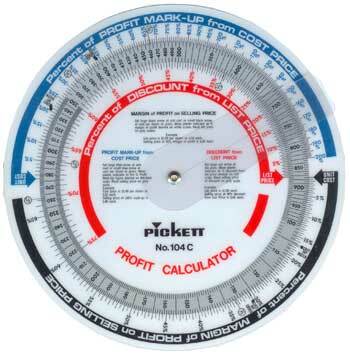 Pickett actually gave these out free to any school that ordered 20 slide rules, to hang on the wall. Once you chose your slide rule manufacturer as a student, you had a tendency to stay with that manufacturer as you went through life. So it was marketing. One thing I’d like to mention is that any slide rules that were imported into America, like the Nestler or the Japanese ones, were required to have a leather sheet or holster, so students could hang it on their belts. Most slide rules sold in other countries either came in cardboard or plastic cases, so this was a new requirement. It was just our standard of quality that we wanted to have. There were also circular slide rules. If you take a circular slide rule that’s only three inches in diameter, then basically because of the circumference of multiplying the diameter times pi to get the actual linear length, it ends up you get the equivalent of a 12-inch long slide rule and yet you can stick it in your pocket. You still have the same resolution with the scales as you would on a larger slide rule. So circular slide rules were really good for increasing the space between the divisions to get more decimal points, or to be able to extrapolate where you thought the scales would be or the number that you were looking for. Collectors Weekly: What was the heyday of slide rules? Konshak: The 1900s, especially during and after World War II. Slide rules were put on every airplane to calculate mileage for navigation. 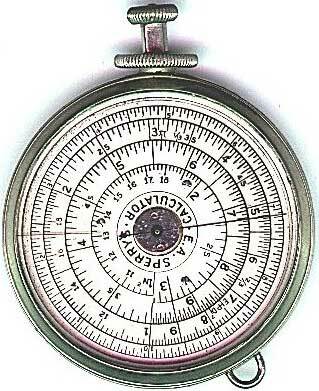 Thousands of slide rules were used on Navy ships for maritime navigation. As we became more and more industrialized, every engineer had slide rules and every math student used them. As people became more and more educated, slide rules were used more and more. If you go to the Smithsonian, you’ll see the slide rule that Werner von Braun used, the rocket scientist. And the slide rules that John Glen used when he went up in space. They took slide rules on the Apollo mission to the moon. They were just a part of our work. It was something everybody had. If you look at Webster’s Dictionary prior to 1970, the calculator was a slide rule, and the computer was the person who used the slide rule. A matter of fact, you’ll see a lot of slide rules that are marked proportional calculator or proportional computer. It was something that helped you compute some conversion for a specific job. Collectors Weekly: When did calculators take over from slide rules? Konshak: In the 1970s the electronic calculator started to take over – the HP-35 is the one that’s most often touted. They actually called it the slide rule calculator or even the electronic slide rule (Texas Instruments called one model that). Every engineering student immediately wanted to buy one, although they cost a lot of money. But even slide rules, the top of the line, most advanced ones, were pretty expensive back then. But everybody had to have one for school. By the end of the 1970s, all the slide rule manufacturers died. Pickett went out of business, and sent all their slide rules out to be scrapped (somebody else retrieved them and stored them for the next 27 years). The companies that relied on selling slide rules disappeared altogether. Those that could move into the computer age did so, but there were a lot of fortunes lost. Teledyne had bought Post in the late 1970s, and then within two years no one was buying slide rules anymore. Some of them tried making electronic calculators too. K&E made them for a very brief period but they couldn’t compete in volume with Texas Instruments and Hewlett-Packard, who were actually making the chips, the transistors and the integrated circuits. They had a cost advantage. Interestingly, the first calculators that came out only did basic math, but not yet any of the scientific or trig functions like sine, cosine, tangent and inverse sine and square roots. So there were several models sold that had a math calculator on one side and a slide rule glued to the back to do those other functions. Those are worth a lot of money if you’re collecting. The disappearance of the slide rule is disappointing because when you used a slide rule, you never knew where to put the decimal point. You had to extrapolate in your head. You’d round up some math – 10 times 200 was about 2,000. So on my slide rule, I’m going to multiply 8 times say 210, I know that by multiplying 10 times 200, I should have four decimal places, four significant figures. And then I would know what the answer was because the slide rule didn’t tell you where to place a decimal point. The calculator does, and it gives you the answer up to eight decimal places, which hardly anybody really needs. So now you have this whole crop of students who have never done any approximation in their head and don’t really know when the calculator gives them an answer whether or not that answer makes sense. That’s the kind of thing that has led to problems like NASA bouncing a Mars rover off of Mars because somebody calculated a metric wrong. That’s why a lot of professors now want to teach slide rules to get people to start approximating in their heads again. Also for understanding logarithms – once calculators came along, you didn’t need logarithms anymore so no one has really learned them. Collectors Weekly: Do slide rule collectors tend to collect other drafting instruments as well? Konshak: Some collect technical instruments like pantographs. But many slide rule collectors just focus on trying to collect every type of slide rule they possibly can. In my buying, I’ve acquired different drafting tools, but I normally end up selling them because I’m not really interested in them. They don’t have the same beauty and touch and feel that a slide rule has. It was just an amazing instrument, and it’s nice to look at. It was a piece of art. Unfortunately a lot of the guys who are interested in slide rules are fairly old, generally 50s and above. I think there’s about 400 active slide rule collectors in the world. Each country has its own organization and clubs that get together and compare their slide rules. As these guys get older, they’re wondering what they’re going to do with their collections. In my case, I beat the rest of them by getting rid of mine in one fell swoop by giving them to a museum. As with many collectibles, rarity drives the value of vintage slide rules. Finding something no on else has, or something really oddball. Scientific American did an article in May 2006 about slide rules titled When Slide Rules Ruled. You can download it off my website. They showed a multicolored Faber-Castell 2/83N slide rule and said it was one of the most complex, prized, and collectible slide rules, one of the finest ever made. They were wrong, it wasn’t particularly collectible. But all of a sudden it started to get interest, and people were paying $400 on eBay for a slide rule that used to sell for $100. In terms of real rarity, two areas to learn about are the older wood slide rules that you don’t see too much anymore, or the circular slide rules that were like pocket watches, there weren’t many of them made. Collectors Weekly: What are some good resources for collecting, and learning about vintage slide rules? Konshak: The biggest club, which I’m a member, is the Oughtred Society. They’re dedicated to the preservation and instruction of slide rules. Then in England, you have the United Kingdom Slide Rule Circle. I’m a member of that as well. Then there’s KRING, the Dutch slide rule society. They cover not only Dutch but also have a lot of German members. And RST in Germany (Rechenschieber Sammler Treff) is a very large group of European collectors. They have some well known members connected to the original manufacturers, like Mrs. Dennert of Dennert & Pape, Jurgen Nestler of Nestler, and Dieter von Jezierski of Faber-Castell. There are also some smaller clubs in Japan. Oughtred Society members have written several books, which you can get if you go to their website, Oughtred.org. They also sell a slide rule reference manual. And there’s a history on K&E, produced by one of the members. They sell a slide rule learning kit, which is handy, and includes a slide rule, by the way. And there are several other books on the different models and history of slide rule – Peter Hopp is one author that comes to mind – that you can buy on eBay or Amazon.com. They show different slide rules and the history and different dates. Peter Hopp has one of the largest collections. Some of these guys have been collecting side rules their whole life. They’re professors and that sort of thing. It’s interesting. If you go back and look at old textbooks written prior to 1970, math textbooks with word problems, normally you’ll find instructions in the back for how to use your slide rule to do the calculations. And so you’ll see chapters at the very beginning of your math book on how you use your slide rule before they actually get into the trigonometry. Collectors Weekly: Any advice for potential slide rule collectors? Konshak: First get a slide rule that you just enjoy using, because you like the touch and the feel of it. Then maybe specialize in one type of them. You’ll go broke if you tried to do everything. I’ve kept one of each manufacturer, one of their more complex ones, and I’ve put it on my wall in my office. Basically the best of breed of each manufacturers and maybe a sample of some of the older ones, how they evolved from wood to celluloid to maybe metal and a complex plastic one. If you try to show those to your friends, they’re going to be bored, especially younger people will just roll their eyes. And so when you display them, it needs to be interesting to look at. The subtleties of all the different models don’t really make much sense to anybody, people don’t really care. But to know that this one was made in Russia and look at the quality compared to the one made in America, that sort of thing might be interesting. Generally collectors just collect for their own edification. We get them because we like them and they’re works of art and you can store them easily. You can put them all in a drawer. They don’t take up a lot of space. Another point is to look for things that can decrease the value of a slide rule, like if somebody has written their name on it. People would write their names in case it got lost. Collectors don’t like that, they like something new and pristine. Personally I don’t care. I’d like to know that this was used by John Brown. But you definitely don’t want them damaged. And you want them complete. The worst thing you can do is buy a slide rule that doesn’t have a cursor or the cursor glass is broken, thinking that you can find a replacement. The cursor is the first thing to break, and there are thousands of slide rules out there that don’t have cursors. So make sure that your cursor is not broken and that the metal isn’t all corroded and operates freely. It needs to be usable. And there are a lot that are just really in bad shape: for example they were in some display case in a window and became yellowed by the sun. The best thing is if you can find them in their original retail packaging. The Internet has really made collecting so much easier, especially finding things you’re looking for. If you don’t find it the first time around, somebody will eventually put one on there. I found a Kurtz Psychrometric slide rule 4175 in mint condition in original case, no markings. What is its value? Thank you. The most important thing about a slide rule is that you have to learn to set up the problem as a equation before you begin. Then you factor the equation to reduce the number of calculations needed, thus reducing the posible errors. With calculators people usually just begin punching in the keys. The calculations are correct but the answer is wrong. The slide rule also required you to know the reciprocals of numbers or how to find them. This is now a lost art. Lastly the loss of logarithms means that fewer people understand logarithmic scales. All growth rates are logarithmic, including the interest function. That lack of understanding partially explains why so many people thought that the economy was speeding up during the last bubble rather than just compounding. If you are interested in the last practice comparing the average growth rate with a decreasing logarithmic rate. It is an easy problem with a slide rule. Best wishes to all the collectors. May slide rules always rule. I have a 6 ft. teachers slide rule in very good condition that I would like to donate. Picture available. I have a Pickett No. 104C that I use all the time. I’ve been using it for about 20 Years. I didn’t know they were obsolete. I was considering buying a new one for a friend, and as I was looking online to find out where to purchase, I discovered just now, that they are not so easy to find anymore. I thought they were still a commonly available item. I carry my 6″ AMP (Amphenol) Presentation Blundell 603 Darmstadt all the time, in its original leather case. I still have my original beaten up Faber Castell 10″ at home. Its worthless because the cursor was broken long ago, but it has much sentimental value to me. I used it when I was an apprentice back in the early sixties. My first electronic calculator was a kit-build Sinclair Cambridge Scientific that I put together in 1976. Clive Sinclair’s idea of selling them as kits was to avoid Purchase Tax – precursor of VAT. You got the two halves of the case and a printed circuit board and just snapped them all together in a minute or so. These things spelled the end of the sldie rule for we avionics engineers. Just read the article and found it of interest. I live in Luton the original home of Blundell ( Rules ) Ltd. I have just learned of a old local retailer, now gone, was producing a range of slide rules. After resurrecting my school slide rulers ( Unique Electrical and a Helix 6″ ) I have since obtained a few Blundell Academies, Omega’s and a couple of WH Smiths versions. Not bad work for a month and a half and cheap too. I go to a community NHS clinic a few hundred yards from the workshop in Chaul End Lane, alas, nothing left now. All rules are used daily as I enjoy designing audio amplifiers or generally playing with them relearning maths ( was useless ). Currently researching into Blundell Brothers. Ernie, You have a slide rule designed by Chan Street, and unfortunately there is not much information published about him. As the curator of the International Slide Rule Museum (sliderulemuseum.com) I would appreciate getting a scan of your slide rule if it is different than the -ES shown in the Pickett gallery in order to document any variations. Send to curator [at] sliderulemuseum [dot] com. If you are willing, we also accept donations of slide rules, which makes you a Friend of the Museum. If there is history of its use by yourself or a family member, please include a short biography and a photo of the original owner (or yourself). Thank you for your support and consideration. Hi Mike. I recently turned up my old Boots slide rule which I had at school. I was always horribly slow at working out maths in my head, and the slide rule did speed me up a wee bit, but I don’t think I really learned to use it terribly well. I’m now relearning, and getting along famously at 57 years of age… Having done all my maths longhand for all these years, or with the boring old soulless calculator, it’s amazing how quickly calculations can be done with a slide rule. Not as quick as a computer program or calculator, for sure, but much more fun! I’ve been using an old Keuffel and Esser basic from 1936 at work, which I got for peanuts on eBay UK. I figure on getting 20 inch later on when I’m more accurate and practised with the ones I’ve got. Most of the rules on British eBay are Thorntons. Did they do any 20 inch models? A lot has been lost by the use of calculators and computers. As noted by others … setting up the problem, thinking about the limitations of the calculation, etc. I have an old K&E slide rule (still in its well used and perfectly sound leather case) used by my uncle (a chemistry major in 1939) and given to me to begin my physics major in 1962. I used this slide rule as a tool through my PhD program and and as a teaching companion until around 1975 when handheld calculators began to take over and became the affordable norm for most students. Bottom line — I don’t want to throw away this slide rule nor do I want my kids to do the same when I croak. Is there a place for it or do I just let it pass into oblivion. recently acquired a Gilson binary slide rule with manual. it has a small bit of damage from humidity. can this be restored? For those of you asking questions in restorations , value or wondering how to donate your slide rule or one belonging to your relatives, please contact me through sliderulemuseum.com. I have not been able to replay directly to any individual post through this website. If you are donating a slide rule with a known history, try to include a digital photo of the original owner (or yourself) along with a short bio, and these will be archived with the slide rule and posted in the gallery. This makes visiting the on-line galleries more interesting to visitors and we can honor their (your) life and career in this small way. ISRM does not purchase slide rules, but for large collections, we can help provide funds for shipping. Thank you for your support and consideration. The International Slide Rule Museum (ISRM) at sliderulemuseum.com has a slide rule loaner program for schools. If you know of, or are, a teacher wishing to demonstrate how slide rules were used to perform calculations, and to improve a students numeracy, ISRM can provide 25 or more matching slide rules at no cost and the slide rules may be kept for as long as one school year. ISRM will pay shipping to the school, and the teacher or school will have to ship the slide rules back at their cost (Priority Mail Medium Flat Rate – about $11). Our only request is that you send digital photos of your class using the slide rules. If you decide to hold a slide rule contest, ISRM will also supply custom medals (Gold, Silver, Bronze). Pictures of the winners are required. Where can I locate a cursor for my Faber Castell 111/54A bought when I was a marine engineering apprentice long long ago? It cost me more than a weeks pay at that time, and I would like to pass it on to my grandson. He laughed when I called it my guessing stick. I have a Keuffel & Esser ‘ Young’s Specific Gravety & Compound Calculator’. Copyrighted 1913, still in its original tan leather cover. I understand it was made for the Firestone company. Could anyone offer further information on this instrument? Thanks, Hugh. I have a collection of very special purpose slide rules used to support sales of many industrial and technical products. Some of them included conventional math calculator slide rules but most were intended to size or scale the products that were for sale. Are they worth more than the cardboard they are made from. Not sure why I kept them, but why do people collect old paintings from long dead artists? Hello, I came across a slide rule in a house I just moved into. It has a case made of brown leather that says “K & E Slide Rule” on the top and on the strap for handle its engraved PAT 2,000.357. T?he actual slide rule says the “unique” log log slide rule and in another place it says “made in England” & in another place, the word copyright on the bottom. I wonder what year it would have been made and if the slide rule actually matches up with the case and if so, what its value is? That’s what I really am wondering, year and value. It appears to be (through web search), the most popular one i find from 1947…..only they all have a piece of chrome at the ends but mine does not. I don’t know if that makes it broken, or made at a different time and i just can’t find it……..that’s something i guess i’d need to know in order to know the value but i hope i can get answers through sending this. I appreciate any assistance you can give me. My dad taught me to use a slide rule and I did all my calculations with it. When I taught freshman chemistry, I had to teach the class to use a slide rule for solution chemistry. We bought a large teaching slide rule. The very next year HP calculator came out. No one could afford one, but it spelled the doom for slide rules. “ ” Early carousels were pretty risqué for a Victorian woman to ride.